Today we begin the last day of the first block of our ‘Embed The Pathway’ sessions. These sessions have been taking place at the AJ Bell Stadium. Embed the Pathway is a scheme which endeavors to put aspiring young rugby league players on our radar here at the Salford Red Devils; who have been noting great success recently and are third in the Super League table. 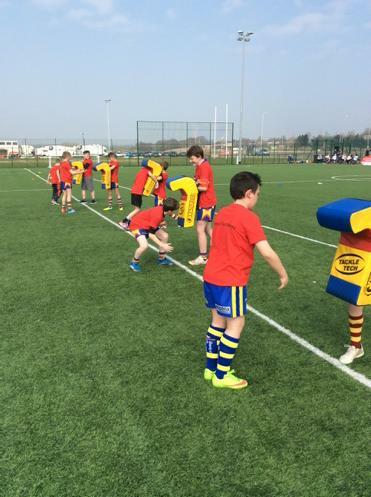 The sessions have been held throughout March and then during the Easter half term. Sessions have been available to both Under 13’s and Under 14’s and aim to harness skills and get players noticed at an early age. Over 100 participants in total have attended ETP and the scheme has been an unrivalled success, we are anticipating an even greater involvement next time round so please ensure you register to confirm your place! Embed the Pathway progamme is delivered exclusively by Salford Red Devils Academy coaches in conjunction with Salford Red Devils Foundation staff. This ensures the highest standard of delivery and selection is being given to all participants from both age groups. ETP is widely regarded as an athlete development programme; and participants will receive support and advice from professionals who have true knowledge in the field. This opportunity could ultimately be the beginning of a pathway leading to becoming a Salford Red Devils star!